WASHINGTON, DC -- The sad reality is that Vladimir Putin is winning in Ukraine. The West must steel itself for a lengthy struggle. Putin, the leader of the 'Evil Empire', is playing a dangerous chess game. In his undeclared, unprovoked, grisly war in Ukraine, Vladimir Putin enjoys several telling advantages. Unlike the bickering Western leaders who have failed to deter him, he is answerable only to himself. He has no real allies, and, because he silences his critics as ruthlessly as he violates his neighbours’ sovereignty, few domestic constraints. Nor, plainly, is he constrained by shame: witness his staggering lies over Russia’s role in the fighting, and his decision, even after flight MH17 was shot down by his proxies, to send in more tanks and troops. Above all, Putin cares more about the outcome than the West does. His geopolitical paranoia, his obsession with the territory lost at the end of the cold war, and the personal prestige he has staked on victory make it essential. And he has a modern army he is willing to use. Because of these imbalances Putin is winning, at least by his own warped calculus. Yet in doing so he has forfeited another edge that he held until too recently, namely the willingness of some Western dupes to see him as a reasonable interlocutor, even a partner. Even the most purblind now know him for what he is: less a statesman than a brigand, not a partner but a foe. That overdue clarity should guide the West in the ongoing struggle for Ukraine. And it should prepare its leaders for the longer and broader confrontation with Russia that lies ahead, which may stretch all round its borders. The fog of hybrid war Hopes of a ceasefire in Ukraine this week were undermined by Putin’s ludicrous insistence that Russia is not a belligerent. But as things stand, any truce will be on his terms. Since regular Russian forces helped the ragtag separatists to turn back Ukraine’s army in devastating style, Ukrainian generals are less concerned with defeating the rebels than resisting a full-scale Russian invasion. Putin’s thuggish boast that he could “take Kiev in two weeks” is dreadfully plausible. Most likely his plan remains a federal Ukraine, with an eastern region controlled by Moscow, or, failing that, a simmering, low-intensity conflict. Either arrangement would wreck Ukraine’s dream of integrating with the European Union and NATO. Even the whiff of peace will encourage some Europeans to argue that Putin need not be punished further—just as there were some who used his denials of involvement as a pretext to equivocate. That would be an inexcusable mistake. As Angela Merkel says, Russia cannot simply be allowed to invade its neighbours and shift Europe’s borders with impunity. The measures under discussion in Washington and Brussels should be much tougher than previous sanctions, including the limp reaction to the annexation of Crimea. Every member of Russian’s craven parliament, security services and government should face visa bans and asset freezes. The offshore assets of top Russian kleptocrats should be identified and seized. Russia’s energy and defence sectors must be squeezed and its sovereign bonds should be shunned. Western lenders should not finance Putin’s warmongering. One aim of all this should be to bolster Ukraine’s hand in the negotiations that, sooner or later, it will probably have to enter. The other aim is to put pressure on Putin. The propaganda pumped out by Kremlin-run television has maintained Russians’ support both for the war and for him; but as the rouble falls, capital flees Moscow and the body bags of Russian soldiers covertly return, his political problems will mount. And even if Western punishment fails to modify his behaviour in the short term, the underlying goal should be to tame him (and perhaps his successors) in the future, for Ukraine is plainly not the end. Putin’s first choice was to suborn Ukraine without invading it, but by demonstrating his willingness to use force, he has sown fear—and, for Putin, fear is the basic currency of politics. A puny, divided response has emasculated the West, which he thinks is bent on weakening and encircling Russia. For him, Russia’s post-Soviet history has been a catalogue of American-inflicted humiliation, which it is his mission to reverse. He wants his neighbours to be weak more than he wants Russians to be prosperous; he prefers vassals to allies. This world view—a noxious compound of KGB cynicism and increasingly messianic Russian nationalism—propelled him into Ukraine. The idea that his adventurism will end in the Donbas is as naive as the theory that he would be satisfied when his troops wrenched Abkhazia and South Ossetia from Georgia in 2008. This week Putin rattled his sabre at Kazakhstan, still ruled by the elderly Nursultan Nazarbayev: any succession squabble would be an opportunity. Estonia, Latvia and Lithuania, small, ex-Soviet countries, have Russian-speaking minorities of the kind Putin has undertaken to “protect”. These Baltic states joined NATO in 2004. But what if a Russian-financed separatist movement sprang up, a Baltic government claimed this amounted to an invasion and its NATO allies refused to help? The alliance’s bedrock—its commitment to mutual self-defence—would be shattered. 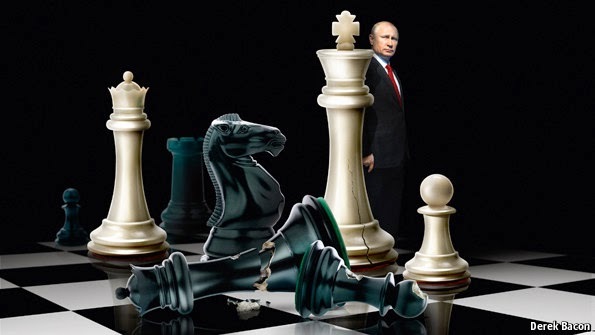 Putin’s revanchism must therefore be stopped in Ukraine. This week, en route to a NATO summit in Wales, Mr Obama visited Estonia to assure his Baltic allies of America’s backing. A brigade of American soldiers would be more reassuring still. NATO is set to approve a nimbler reaction force, with kit pre-positioned in Poland. But it is past time for the alliance to junk the undertaking it gave Russia not to base troops in the Baltics: that was made in an era of goodwill, which Putin has trampled. The Europeans must do more to wean themselves from Russian gas, by diversifying supplies and introducing new rules and infrastructure to trade energy across the continent. Putin is not a good commercial partner. Eventually these measures may together force Putin to rethink his recklessness, or encourage the Russian people and elite to think differently about him. There will be a price for the West too, of course. But as poor, benighted Ukraine shows, the price of inaction has always been higher.